Use a footrest: Purchase a footrest or use old phone books that are approximately four inches high. This will raise the height of your knees and effectively changes your center of gravity backwards, helping you to improve your posture. Sit close to your desk: Be as close to the edge as possible. It will prevent you from bending forward over the desk. Keep your back supported when sitting: When you will be sitting for long periods of time, you should make sure your back is supported from the lumbar region (lower back) to at least the shoulder blades. The chair you sit in should support the whole spine, right up to the neck. To avoid bending your neck to look down, try placing a small lectern on the desk or table top. Take stretch breaks: If you are sitting for a long period of time, get up and stretch for a few seconds at least once every hour. Tilt your pelvis slightly forward (towards your rib cage): Tighten your abdominals and keep your head directly over your shoulders and pelvis. Try not to pull your shoulders back, as this may actually worsen y our posture. If it is hard for you to hold this position, try placing your feet slightly apart with one foot in front of the other and bend your knees a little. Use a railing or box to prop one foot up: This will take some of the pressure off your back. You can also place a rubber mat on top of a concrete floor to help ease pressure. Change your feet and positions at least every 20 minutes: This will keep your back from getting “stuck” in the same position. Take your task in consideration when choosing a surface height for your desk: For example, an architect will need a higher surface for drawing, but a person who works on a computer all day will more than likely want a desk surface where they can sit or stand, depending on the need to use other tools or references. Your work surface should be elbow-high. Your fist should be able to pass easily behind your calf and in front of the edge of the seat to keep your legs from being pressed too hard and your feet from swelling. Two fingers should slip easily under your thigh. If not, place a footrest under your feet to raise your knees to the same level as your hips. The backrest of your chair should push your lower back forward slightly. 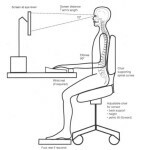 Fix the height of your computer screen: Sit comfortably at your desk and close your eyes. Slowly reopen them. Where you first gaze is the place to put the center of your screen. You can easily raise you screen with books or a stand if need be. is your workstation, office or desk at the right height?